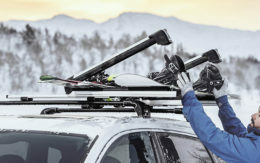 To get a feel for how winter sports enthusiasts use their vehicles, Trucks.com assembled a panel of expert-level skiers and snowboarders to evaluate four snow-capable vehicles in Brian Head, Utah. 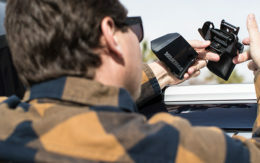 Although we are automotive experts, evaluating trucks and SUVs constantly, we wanted to see how people use vehicles in their own lives to pursue their personal adventures and passions. You can read about our evaluations here. Our panel included outdoor enthusiast Arielle Shipe, backcountry skier Justin Mayers, adventure photographer Samuel Lippke and board-riding attorney Steve Isbell. They tested a Chevrolet Tahoe SUV, a Ford F-150 pickup, a Subaru Outback wagon and an all-electric Tesla Model X crossover, vehicles chosen because each is the most popular in its respective segment. The group traveled from Las Vegas to Brian Head for a day of snowboarding and skiing and back, a 430-mile roundtrip that offers a mix of highway and mountain driving. While in Brian Head, the panelists drove the vehicles in snow, ice, steep grades, sub-freezing temperatures and 9,800 feet of elevation. Arielle Shipe is a yoga instructor and avid outdoor adventurer from Aspen, Colo. She has a voracious appetite for climbing, hiking and traveling. She has been snowboarding since she was 10 and rode competitively in high school and college. Most frequented park: Snowmass, Aspen, Colo.
Justin Mayers is a photographer and videographer from Jackson, Wyo. He has been skiing since he was 2 years old, and partakes in other outdoor activities like hiking, camping and skydiving. He creates content for his own YouTube channel and is currently touring 17 resorts in the U.S. and Canada. Most frequented park: Jackson Hole Mountain Resort, Jackson, Wyo. Samuel Lippke is a photographer from Long Beach, Calif. His snowboarding expertise extends back two decades. His first board was crafted from an old fence post. He lives an active, coastal lifestyle and travels often. He has two dogs, Musket and Nelly. Most frequented park: Mammoth Mountain, Mammoth Lakes, Calif.
Steve Isbell is a 30-year snowboarder and surfer from Long Beach, Calif. For his day job he practices law at a firm in Orange County. He’s also dad to two little kids, who are both already in skis. When precious time allows, he’s traveling by car or plane.